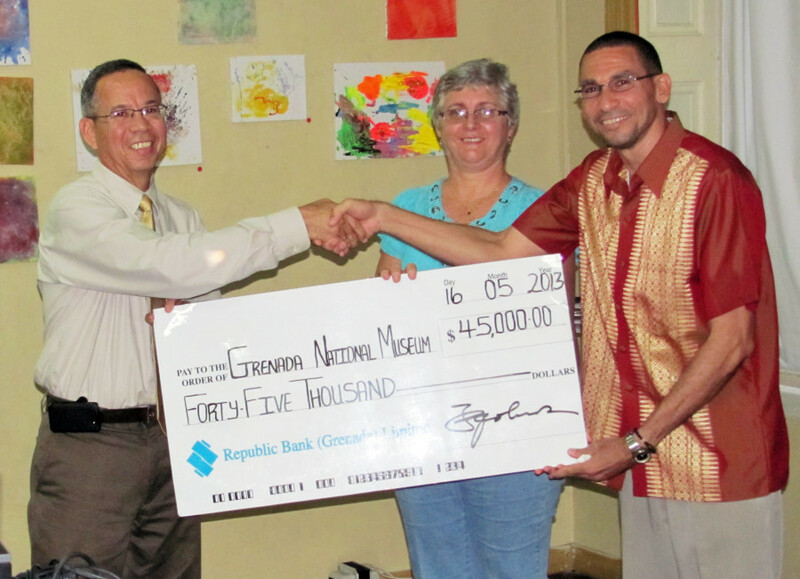 At the end of an evening of discussion at the Grenada National Museum in celebration of International Museum Day, the Board of Directors was presented with a cheque for $45,000 by Mr. Keith Johnson, Managing Director of Republic Bank (Grenada) Limited. This was in response to a proposal submitted by the Museum requesting funding of new exhibits for the Amerindian Heritage and European Invasion Rooms. Republic Bank has become the first major donor towards transforming the Museum into a premier attraction for residents and visitors. The Grenada National Museum humbly thanked Republic Bank for its significant investment and vote of confidence for this new direction. Mr. Johnson remarked that it is important for a nation to preserve its history, heritage, and culture, and that Republic Bank’s contribution to the museum’s revitalization plan is aimed at fostering that preservation. The donation was made under the Bank’s “Power to Make a Difference” programme, through which financial support is given for the development of people through education and the empowerment of the communities in which it operates. Presentations on the future of the Museum and its role in education and tourism, by artist Suelin Low Chew Tung and museum members, Liz Raffety and John Angus Martin, were part of the Museum’s open house to mark International Museum Day. Senator Brenda Hood also participated in the open house; lauded the museum and its initiatives; and said that the museum had the backing of the Ministry of Culture.